Most patients seeking face lifts say that coworkers or family members tell them “they look tired” all the time. They then proceed to pull upward on their neck or lower cheeks mimicking the effect they want from surgery. To make a point, I sometimes cover my face and ask what color my eyes are. They always get it right (my eyes are brown). I then ask whether I have bands in my neck (I have one). Invariably they say they didn’t notice. People make judgements about how old your face looks from your eyes, not your neck or jowls. There is a famous study where the picture of a woman was put on a screen. A subject looks at the picture. Behind the screen there is a camera that tracks the eye movements of the subject looking at the picture of the woman (see image). On the left, we see the picture of the woman. 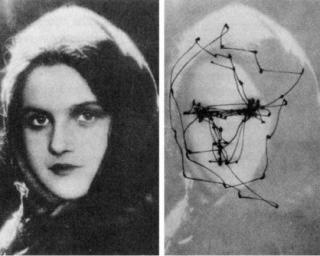 On the right we see the tracking pattern of the subjects eyes as he looks at the picture. Notice that the vast majority of the subject’s eye movements track back and forth over the woman’s picture eyes. There are a few passes from eye to nose and back to opposite eye, and fewer still to the mouth. There is only one pass around the patients facial contour. Thus in summary, the experiment illustrated that people notice your eyes first. This has implications as to surgical choice. If you want to look younger to other people, focus on the eyes. If you don’t care how you look to others, but your jowls really bother you, you may elect to do a lower facelift. As a surgeon, I have a preference based on anatomical details and experience. Because other people concentrate on your eyes, my first priority in making you look younger is the forehead and midface area. That’s “where the action is”. The little known fact is that the Brow lift (forehead lift) will lift your upper eyes. A forehead lift is done with an endoscope so it has minimal scarring. The mid facelift is done through small incisions inside the mouth. Thus you can have a major impact on the appearance of the face with no visible scars, just a few small incisions hidden within the hairline, and no stretched-out look. As a matter of fact, after a browlift most patients remark that people tell them they look better and refreshed, but can’t quite put their finger on what was done. The lower facelift, in contrast, has the benefit of smoothing out the jowls and improving the neck, but if not done correctly, it can give you a stretched out or “done” look. Even if done correctly, as I do it, the lower facelift will not change anything about your eyes. Thus if a patient has to choose between the upper facelift and the lower facelift, I usually encourage the upper facelift. If the patient insists, of course I will do a lower facelift. Before doing so, I show them pictures of patients who have had only mid facelift and browlifts, as well as pictures of patients who have had lower facelifts only so they can better judge what the want. Ultimately it is your decision, but I always try my best to guide you through your decision process.